Yea, the textures were external and paletted... I also thought I like to have some variety. 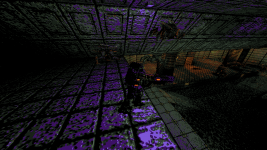 One project on a Doom engine and another on a Quake engine. And I tried some map, textures and the player model in Engoo some year/half year ago. But anyway, the current monster amounts are too much for (any?) 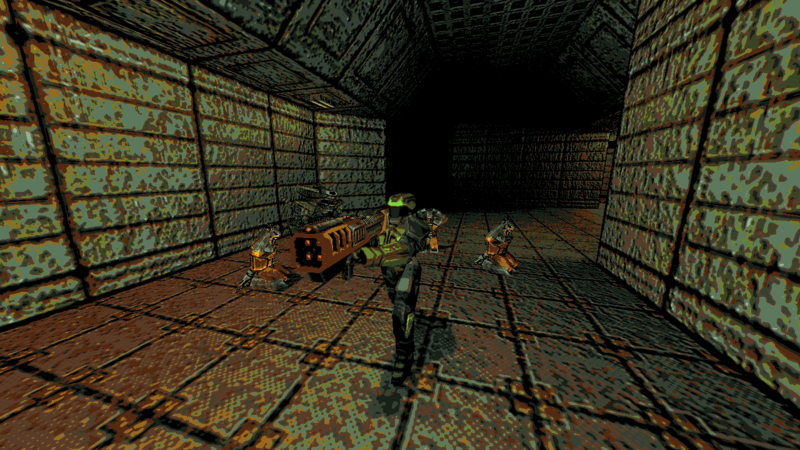 Quake engine to handle. My earlier tests in DarkPlaces with tons of monsters were like.. Player had a weapon or two that could easily kill 100 monsters with 1 shot, and then all those 100 monsters turn to 3 to 6 gibs. Framerate dropped a lot. Even 20 gibbings at the same time was too much. And 20 in 1 shot(or very short time) may be quite common. 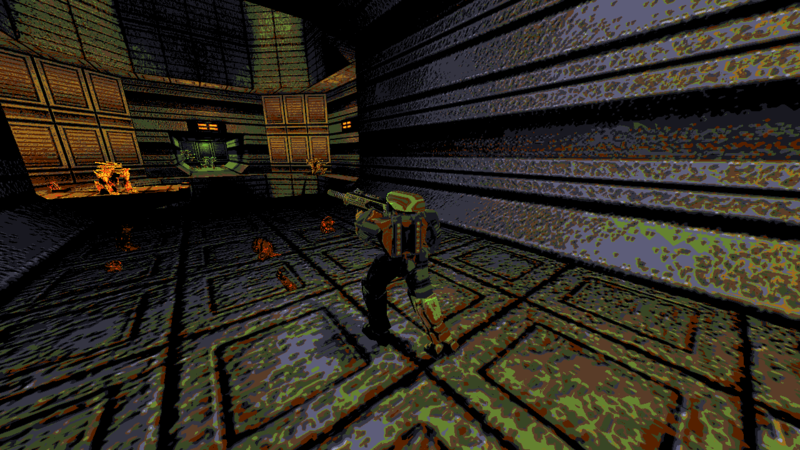 I think it's that AI works faster in Doom engine, because it's simpler. It doesn't really look like model polycounts have that much effect. There can be like 500 models onscreen in DarkPlaces, but as soon as they all turn active... fps down to 5 or less. 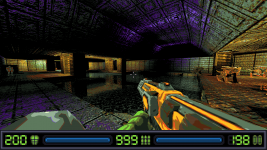 I think there's a limit how much AI Doom engine can handle, but it's so high, the limits how much players can handle appear sooner. I noticed a slight framerate drop with 6400 monsters, but it was still playable rate. jim wrote: Yea, the textures were external and paletted... I also thought I like to have some variety. One project on a Doom engine and another on a Quake engine. And I tried some map, textures and the player model in Engoo some year/half year ago. 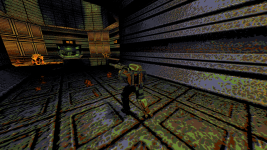 Not only the AI, but the physics in Doom are much simpler, too (collisions are tested only in 2D; all entities are cilinders). It changed back to DarkPlaces. I think I also release the Doom engine version some time, but it's going to be pretty much as it as. 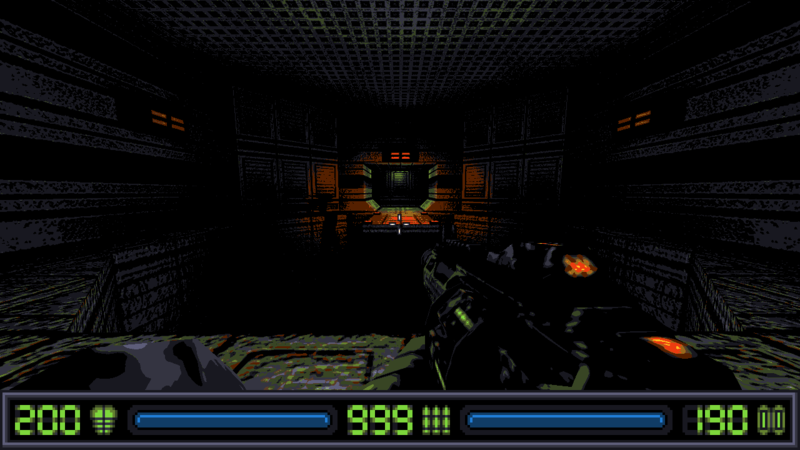 Thought it could have a few more levels, when I feel like making some Doom type level editing. The current plan for the game is semi-randomized missions. Started testing the random mission stuff. Player/enemies/civilians are spawned randomly. Mission ends when player has killed all enemies or died too many times. If too many civilians died, the mission failed. Enemy/civilian counts can be set in the level editor. Game difficulty/mission type/player status should also affect the enemy and civilian counts. I tested some random light changes. Sometimes a level can appear dark. I also tried some alternate palette, which could be used randomly or set in the level editor. Ambient sounds got randomness. Each ambient sound entity has a list of sounds it can play. All the entities/lights in the levels should have some "group". At level start up, one or more groups are selected to be active. Only the active group entities spawn/appear, have light, play sounds. This way some parts of levels could be blocked without anything spawning into the blocked areas. I decided to use Q1BSP to have it easier to do the lighting all in one place, and RT lights are too slow with these monster amounts. Even if I only used them to have lightstyled lights with Q3BSP. Well, now the aliens have a bit stupid size. I found out that only the X size is used to determine which hull they get, so now they're 32x40x48 instead of 40x40x48. Another problem with Q1BSP is Shambler size entity touching a brush entity with liquid content.. the game crashes when the Shambler size entity touch the brush entity. So it would seem I can't have randomly On/Off liquid or moveable liquid. There's also weapon reloading. I made it so that player can't reload the weapon manually until shot 50-75% of the magazine, to avoid making the civilians remind player about reloading the weapons after every few shots. Though the rocket launcher can be reloaded quite often, as it only holds 4 rockets. The (automatic) reloading when magazine empty can be skipped with weapon change, of course then the weapon isn't reloaded. Weapon change is faster than reload. Also there's no visible counter for the magazines, there's just the total ammo count. I decided to do it like this, so that there would be more chance for the weapon reload to happen at a bad time, which makes the reload feature more interesting. the new video on moddb makes the game look really fun! 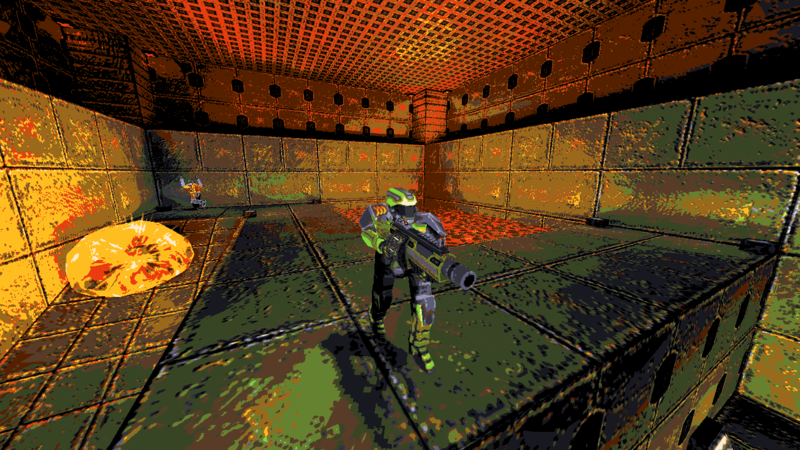 Then I thought to make the models like they were in Quake or Quake2. Tri counts are somewhere around 600 now and UV maps are planar Front/Back kind of maps. This makes it faster to make sort of good quality UV maps, as I can just use the 3D view for the UV mapping. Weapon UV maps are a bit tricky though. Soylent Green is Bug People! They throw bio grenades with one arm and slash with the other in melee. Their texture is like done in 10 minutes. Just wanted to get a look at them ingame. The new weapon is Gauss Shotgun. It's sort of a mix between Shotgun, Minigun and Railgun. It could share ammo with the Grenade Launcher. It would fire 8 pellets in a quick burst, then some delay before next shot. The pellets could explode or go through targets, possibly hitting another behind the first target. 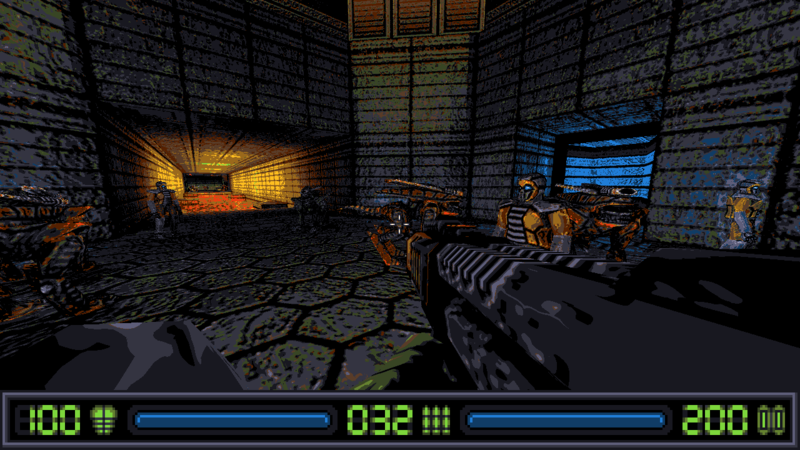 I think I can't do my earlier idea of multiple ammo types for each weapon, and have to limit the ammo types into the 4 in the HUD counters, plus unlimited for the first weapon. Each weapon slot could have 2 weapons, but first I'll just do 7. The energy icon could change when player has some powerups, like jetpack. There can be 3 powerups, or 4 if player always has one. The current icon could be the jetpack icon. Heh, I like the new enemies. How do you intend to deal with the hud ? Will you just adapt to standard Quake status bar or will try to customize at engine level ? It's not hard really, just messy. Thanks. 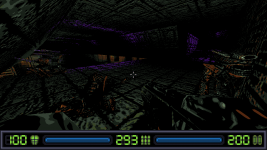 I'll just try to get things work with the Quake HUD layout/limits. Sure now it has some useless parts, like the runes and the powerup slots are filled with some decoration. I would have probably used the powerup slots for something, but since they force a palette shift and the invulnerability changes the energy/armorvalue to 666.. that's not going to work. Ammo counters should have gone up to 999, but whatever, the max ammo counts are going to be from 50 to 250 then. Health and Energy are fine with 200 max. 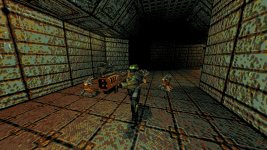 which software quake engine are you using? WinQuake mostly. Occassionally check if it's working in DOS Quake too. 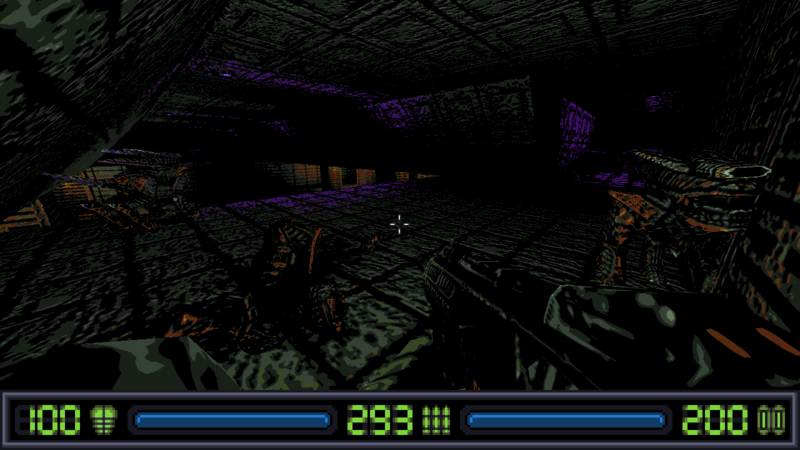 I wonder if I should keep colored lighting in the levels, there's at least Engoo that could display them in software. Need to redo the palette. I noticed the colors don't go overbright nice at all. They just suddenly change to the brightest color in the palette. Oops. looking good! can't wait to check this out when it's completed! Yea, so it changed to a minimalistic styled zero gravity flight game some 3 weeks ago. 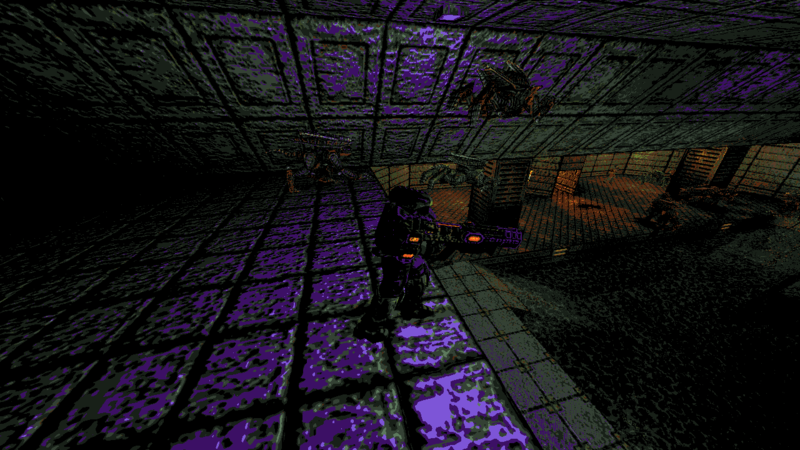 Continues with the WinQuake engine (may work with other engines too). The game can be played almost with just the mouse. Keyboard is used for weapon changes. 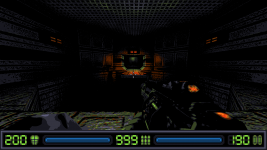 Player's spacecraft moves automatically forward. Holding down the "Move" button accelerates. Double click + hold activates "Turbo" move. Aiming is fast, but it takes some time for player's movement direction to change to the aiming direction. This allows some sideways strafe and up/down hovering. Colliding into walls or things may cause damage. Player has 5 Main Weapons and 4 Support Weapons. The main weapons generate heat when they're fired. When they're too hot, they don't fire. Support weapons can be fired any time. Environment and explosions can affect the heat levels too: dive into lava and you get hot.. dive into water and you stay cool longer. Turbo move also increase the heat levels. Anyway, here's a new video showing off Laser Cannons (with a powerup), Plasma Shield powerup, Autocannons, Plasma Cannons, Missiles and 2 Enemy types. WinQuake seems pretty bad for heavy action. Just have a dozen enemies around firing at player, and boom it's "packet overflow". Well at least it doesn't crash the game, but it's pretty annoying when sounds are no longer played, and everything's kinda lagged. I was able to do some kind of workaround with limiting how many enemies can be in the level at the same time and how many projectiles they can fire. When player destroys an enemy, then there's room for some more. If it's a large level, then enemies may need to be removed/teleported away when player is no longer there, so the enemies would always be around player. Or maybe use some monster blocking invisible blocks, though this wouldn't work so well on some big areas with long range visibility. To compensate for the lack of large enemy masses, I increased the hitpoints of the enemies to make them more dangerous even if they're alone. Could probably increase their projectile speeds and damages too. Projectile speed increase would also make the projectiles hit something faster and allow the enemies to fire again sooner. They're quite challenging already.. it took me like 10 tries to complete the level in the video (though I was kinda sleepy when recording it). The textures came from my earlier minimalistic Doom content pack, so there's some Doom texture replicas, and looks like I'm keeping the Doom texture replicas... But no plans to make more replica textures. Majority of the textures should be fresh/original. All the item models are complete. Enemies can drop the smaller ones. All have some glowing parts to make them easier to spot even in darkness. There's 6 powerups. Most of them are limited time, and picking up the same powerup again adds to the time. Automatic Repair System: repairs player's armor for 30s up to 250 points. Heat Shield: decrease all heat levels 50% when picked up, weapons cool faster and heat slower. Allow moving in lava and acid without taking any damage. 25% damage protection. Lasts 60s. Super Shield: protects from all damage 100% (75% in DM). Malfunctions in water (but works in lava and acid). Lasts 30s. Laser Amplifier: improves the Laser Cannons to fire more realistic kind of laser beams with faster fire rate and damage. Lasts one level. Plasma Shield: protects from all collisions to walls/enemies, creates no self-damage explosions every 2s or when colliding with something. 50% damage protection. Lasts 30s. Cargo Module: double/increase max ammo capacity and give some ammo. Permanent upgrade. very cool, jim! I like swimming combat! Reminds me of descent a lot! I love how much passion you're putting in this project! You say on ModDb page : "The game can be played almost single handedly with just mouse.". So, the player always runs by himself? Another question: how do you create sounds? They're great! It supports mods, but can be a bit tricky to get working right.